Nowadays, when the “cook” is also housemaid, chambermaid, waitress, nurse, chauffeur, gardener – as well as wife, mother, job-holder, and community leader – the “dailiness” of food preparation is more challenging than ever. It’s a big job. And the wonder of it is that so many do it so well, turning out an incredible number of eye-filling, soul-satisfying meals with skill, imagination, and grace. Planning, buying, preparing, and serving three meals a day means 1,095 such efforts a year (add three for Leap Year)! No wonder that once in a while they bog down – even the best of them. Reminiscing about the 1950’s might bring to mind the image of a picture-perfect housewife, such as June Cleaver from “Leave it to Beaver.” There she is, wearing her pearls, high heels, and matching floral apron as she gracefully dances across the kitchen. With whisk in hand she twirls with ease, like a ballerina in point shoes floating across the stage. She was one of the ladies who was doing it “so well.” But was never as easy as June Cleaver made it seem. Not even close! The General Foods Cookbook, published in 1959, reminds us that some things never change. Busier than ever, the daily chore of food preparation can bog even the best of us down. This book was written by the “Women of General Foods Kitchens” – working women who understood the need for quick, simple, wholesome meals. Sprinkled within the 435 pages of recipes are the encouraging voices of General Foods women, telling us their stories and cheering us on. (This book) was planned for you, and is dedicated to you… to women everywhere… from the women of General Foods Kitchens. “Bread n’ Butter Waffles” is the second recipe I chose to highlight from this book. The first was the equally fun and creative Crispy Baked Eggs. I must admit I giggled when I saw this Bread ‘n’ Butter Waffles recipe, and was highly skeptical of the outcome. 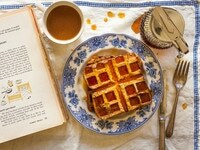 Fork in hand, I poured the maple syrup over the crispy bread disguised as a waffle. With each bite I kept asking myself, “Does this taste like toast? Or do you just think it tastes like toast because you know it’s bread?” When the plate was empty and only a sticky crumb filled pool of syrup remained, I realized it didn’t matter. It was an “eye-filling, soul-satisfying meal” made with imagination and grace. 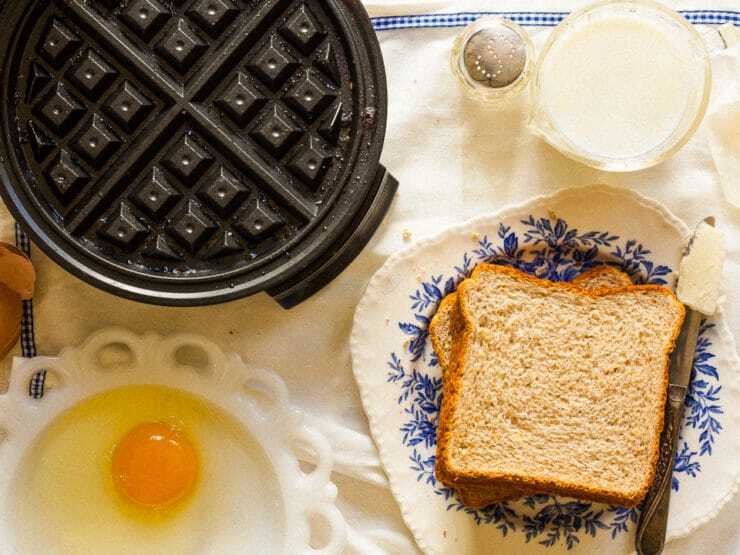 With simple recipes like Bread and Butter Waffles and Crispy Baked Eggs in my repertoire, I feel one step closer to June Cleaver’s seemingly effortless style and grace. 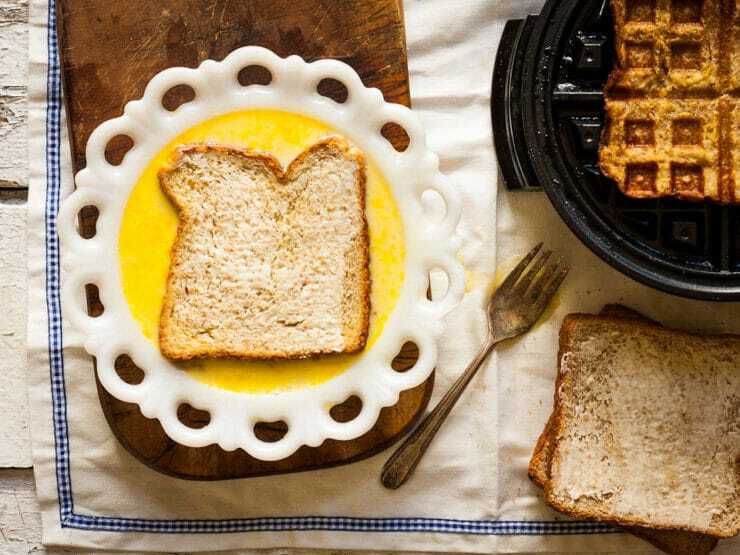 A quaint and ridiculously easy vintage recipe for Bread and Butter Waffles from the 1950's. A cross between French toast and waffles. Spread bread slices lightly but evenly on both sides with butter. Combine milk, salt, and beaten egg; blend well. 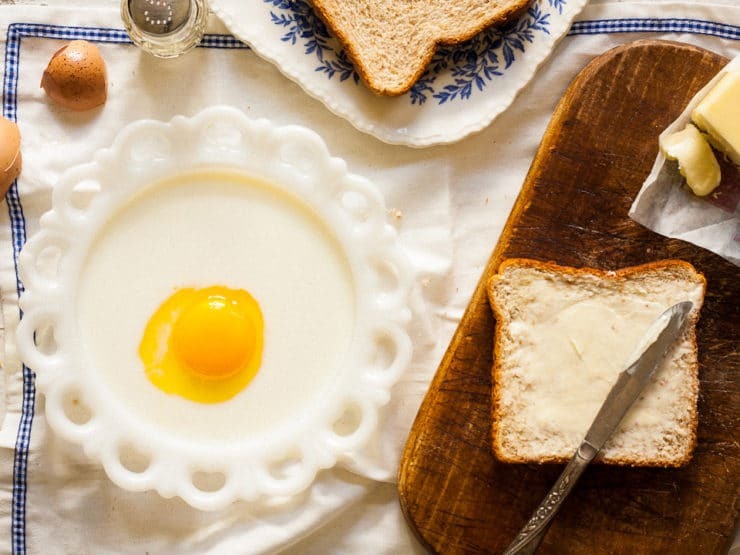 Dip slices of bread into egg-milk mixture quickly. Drain. Bake in moderately hot waffle iron 5 minutes, or until golden brown. Serve hot with syrup. French Toast in a waffle iron sounds like a good idea, but the times I’ve tried it the bread stuck to the waffle iron. Half on the top iron, half on the bottom. 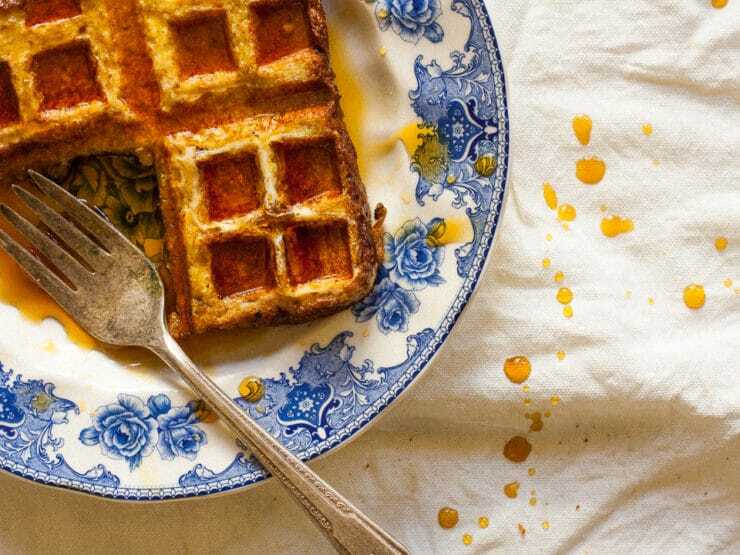 Messy and sticky, even with a non-stick waffle iron. Is this recipe somehow different than most french toast recipes? I see they have you butter the bread on both sides, maybe that’s the key to success? Do you dip both sides in the egg mixture or just the one without butter? It is really a good idea. Thanks for sharing. I would like to share with you a Savory Waffles that I learn from a Taiwan TV program. Cut some big onion into small slices, hot dog sausage, green peas, pepper & salt. Fry them well and season and cool it. Make your waffles but don’t add in too much sugar !! Before you grill the waffle, mix the cooked sausage into the batter and make just like you make your Waffles !! It is so yummy !! French toast cooked in a waffle iron. Isnt this similar to french toast? what a fun recipe. I’ve been craving waffles. We make “waffle toast” with buttered bread, no egg. Crispy and delicious! I would love to make these but I don’t have a waffle iron. Using this recipe at home! Made homemade waffles this past week for my son’s birthday, and would love to try a new one out on him and my hubby too! I can’t stand Eggo’s, and their ilk. At last, a recipe I’ve used years to satisfy our children and theirs. You just give these a try! I made them for my 9 year old son and he didn’t even know they weren’t his regular waffles. Great idea, it is like a modified French Toast. It is! French Toast Waffles.